The mobile app revolution has got us accustomed to the ease of use and on-demand resources. According to a Statista report, mobile apps are projected to generate 188.9 billion U.S. dollars in revenues via app stores and in-app advertising in 2020. An efficient tool for engaging, informing and assisting customers or employees, mobile applications create lucrative opportunities for businesses. Offering flawless conveniences and promising endless possibilities, mobile apps have become the go-to business mantra of the date. However, cut-throat competition makes it difficult for most mobile app businesses to pass with flying colours. All businesses aim to increase their audience outreach, but most remain uncertain about how to proceed in this incredibly dynamic environment. More often than not, the reason for the failure of a brilliant mobile app idea lies in loopholes in its mobile app architecture. We at Promatics, help numerous clients create mobile apps that are winners in the ever-evolving mobile app landscape. 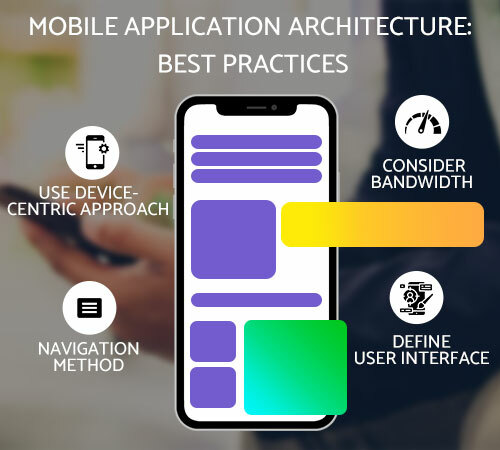 The following article highlights some key insights relating to mobile app architecture, that we have learned through years of experience in the field. The presentation layer contains UI components as well as UI Process Components. The app development team defines the way the final product will be presented in front of the users. The main focus remains on decisions like the number of features and their placement on the app, at this layer. Other important aspects of UI like theme and font size etc are discussed at this stage too. 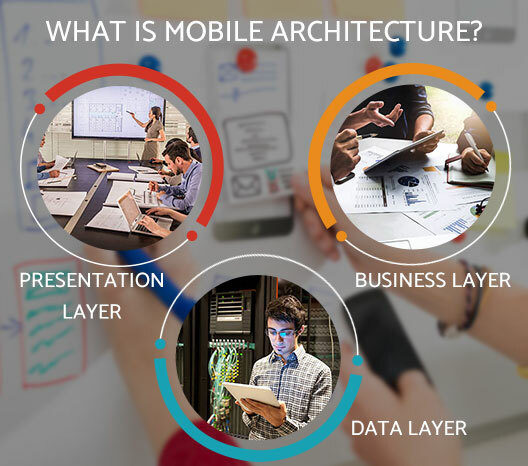 The second layer of the app architecture is the business layer that comprises decisions around workflows, business entities and other business components. The layer helps define how the business will be presented in front of the end users. Further subdivided into two layers namely service and domain layers, the layer defines a common set of application functions that will be available to the end users and also provides expertise and knowledge about the specific problem domain. The motive here remains to explore and enhance the future of application. The final layer of the app architecture, data layer comprises of data utilities, data access components and service agents. The focus here is on providing simplified access to data and its storage as well as networking call management. We hope we have convinced you about how choosing the right architecture should be an obligatory step during the design and planning phase of software development. a.) It makes the app more prone to errors. b.) It makes the app difficult to develop and maintain. c.) It makes the code to the app less readable. d.) It makes it difficult to carry forward the mobile app development project as a team with no common reference like app architecture. e.) It becomes difficult to test the app on various functional criteria. This, in turn, makes the software development difficult. In recent times, we have seen a vivid focus on app architecture practices. Seasoned app developers know having a clearly prescribed app architecture in place is a stepping stone to success. This gives them a better overview of their work and the data flow in the application. However, there are inexperienced freelancers or newbies who are ignorant of these best practices. They assume that developing an app without planning architecture is a time-saving strategy. The apps they create are based on low-quality source code and don’t comply with architecture necessities. Sometimes the apps they develop are built on outright antipatterns. Eventually, it becomes very hard to develop these apps further and results in a massive loss for the app business. Configuring app architecture first ensures that the final product excels in quality and is as efficient as planned. It is important to keep device types in mind while working out mobile app architecture. Considerations like screen size, CPU characteristics, resolution (DPI), storage space, memory, development tool and environment availability matter while doing app architecture. This is because these features in the application might have special requirements from hardware or software components. Make sure you have knowledge of all the devices that the app is going to support at the time of building the app architecture. Haggling with inconsistent connectivity is a pain point that needs to be eased out. Ensure that your app architecture is built keeping in mind the worst network scenarios. Always design caching, data access mechanism, and state management counting in times of intermittent connectivity. Save the creative showcase for later stages of app development and updates. Make an effort to let user interface as simple as possible at first. Confusing UI can become a reason behind a mobile application’s failure. An app with good architecture features components with multiple responsibility layers. It often enforces assumptions and good programming patterns like SOLID, KISS too. These pre-requisites of an app with good architecture allow you to align the development process so as to save on time and development cost. They also make maintenance of the app easier in later stages of development. Choosing befitting architecture along with reliable platform-specific technology for a mobile app is the basic need for a thriving end product. This helps in solving complex business problems in the most effective way at later stages. Moreover, this also saves developers from vessels that hybrid technologies bring. Our team takes great care that app architecture we design is versatile enough so that it can be applied on various platforms – like iOS or Android. This saves development time for the business. As more and more businesses realize the need for integration of mobile technology for success, the app market is set to be a battleground that aids the survival of only the fittest. Appropriate app architecture brings down the long term app development and maintenance cost considerably. It also serves as a blueprint for the whole app development procedure, helping a business achieve the app it visualized. These reasons make an app architecture plan a foremost requirement for the planning phase of the app development process. We hope the guidelines suggested above will streamline the development procedure of your mobile app. We prioritize app architecture planning in all our projects to save on time and resources of our clients. Feel free to write to us if you have any queries regarding the process of mobile app development in general or app architecture in particular. Rahul has been associated with the apps industry for more than 7 years now. He has seen the apps economy grow from its nascent days to a full fledged industry with its complete ecosystem as of today. His interest lies in pursuing and getting to know the best app development technologies, processes and platforms. He is truly an app enthusiast. In his free time he loves playing console games and reading history.